A simple isometric hand exercise may help those with high blood pressure. Research at McMaster University in Ontario, Canada shows that patients who completed 8 weeks of isometric hand grip training were able to significantly reduce resting blood pressure. This easy-to-learn hand exercise seems to somehow reprogram the way the nervous system sets its control level of blood pressure. More research has to be done to explain exactly why and how this works, but evidence is building for the benefits of using this technique as a lifestyle modification for hypertension. As this quick and easy technique helps with high blood pressure, it also can reduce anxiety and stress levels. Get a hand gripping device found at sporting good stores. Grips come in a variety of resistances that feel different, so try them out until you find one that feels comfortable for you. To determine whether the grip is sufficiently intense, hold the grip steady, keeping your body relaxed and your breathe normal. If your hand tires after 2 minutes of squeezing the grip and holding the contraction, then you have found the correct grip. Dr. MacDonald says you need to grip at least 30% of your maximum strength; less than that does not have any impact. Here’s the exercise sequence that Dr. MacDonald recommends 3-5 times each week. Remember to breathe normally. * Squeeze the grip and hold the contraction with your left hand for 2 minutes. * Remove it and rest for 2 minutes. 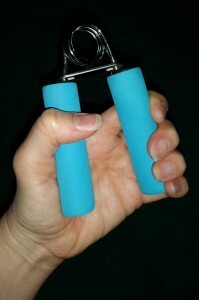 * Squeeze the grip and hold the contraction with your right hand for 2 minutes. * Repeat this sequence 4 times. Can Spirituality and Prayer Reduce Stress & Anxiety?